Students interested in directing often begin by taking the directing studio courses offered while serving as assitants on shows. Please contact the department about current and future course offerings: theater@ucsc.edu. 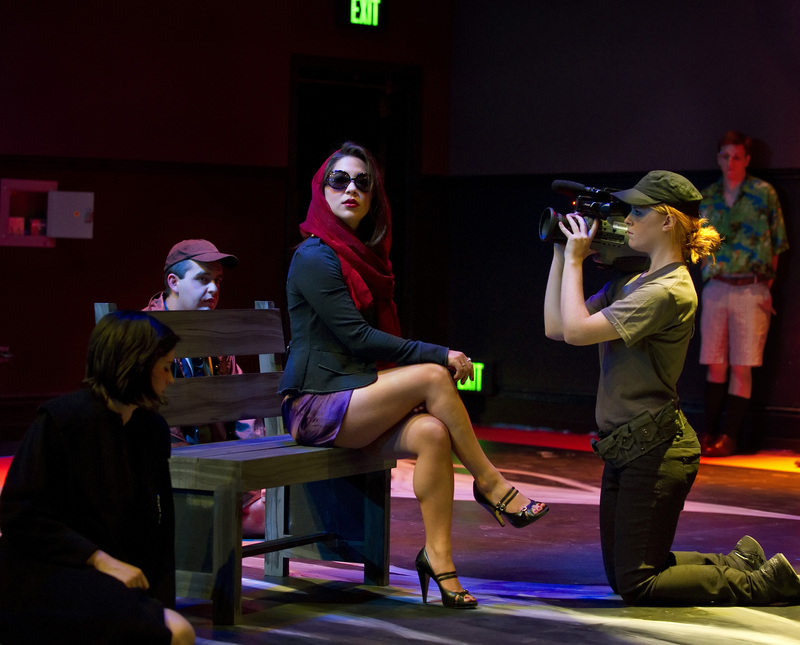 Each quarter the UCSC Theater Arts Department stages 2-3 productions in dance or drama. These shows are directed by a combination of visiting professionals, faculty, and advanced directing undergraduate or graduate students. Students interested in serving as an Assistant Director can contact the director of a particular show directly to request a post. It is entirely at the discretion of the Director to accept a student's petition or not. If a director accepts a student as their AD, the student will enroll in the production as a class. Serving as AD to a faculty member can fulfill the faculty-directed production requirement for the Theater Arts Major. Grades for student ADs will be determined by a faculty director, or by a faculty advisor upon recommendation of a student director. The role of a particular AD on a production is determined at the discretion of the Director. Certain productions may have multiple AD's, fulfilling different needs of the production. The duties and responsibilities of an assistant director can range widely, dependent upon the director, the production, and the student's own range of experience and ability. The can include note-taking during meetings and rehearsals, being on-book, running errands for a director, making copies, leading actor, dancer, or singer warm-ups, video editing, dramaturgical work, running lines, etc. It is highly recommended that a student AD arrange to meet with the Director as early as possible, and at the very least before the first rehearsal in order to determine the Director's expectations and assignments for the AD. The Director may request an AD's presence at auditions and call backs, or even at preliminary production meetings which may take place during the quarter prior to the production, so the earlier the better. Chautauqua is the annual student play and film festival sponsored by the Theater Arts Department in the Spring Quarter. Student playwrights are given the opportunity to submit scripts for short plays.The selected scripts are then made available to students interested in directing for Chautauqua, who have the opportunity to read and submit proposals for as many of the chosen plays as they are interested. This gives students the experience in submitting a directing proposal. The Chautauqua committee will then review proposals, and select the student directors for each play. Script and proposal submissions are due during the Winter Quarter, so that directors are in place and have time to prepare prior to auditions at the beginning of Spring Quarter. Please contact the Theater Arts Department for current deadlines and qualifications for directing for Chautauqua. Barnstorm is a student-run production company based on the UCSC campus. It operates 1-3 quarters of the academic year in the Barn Theater, and produces primarily student-directed and produced work, either as full productions or one-nighters. Barnstorm produces a wide-range of productions, from traditional and classical plays to student-written work, dance shows, multi-media presentations, improv, clown, futurist and more. Proposals are reviewed by the Barnstorm Production Management team, usually comprised of 2-3 graduate students taking on the roles of Artistic and Managing Directors. Directors for full shows and one-nighters will be selected based upon the feasibility of the project, the materials and skills available, the background and experience of the director, the vision of the project as fits into the Barnstorm season, advance work done to prepare for the project, opportunities for students, and how well the project relates to the Barnstorm mission statement. Proposals are generally due toward the end of the quarter before the quarter of production. This means a production for the fall season of Barnstorm would need a proposal submitted at the end of the previous spring quarter. For current deadlines, or Barnstorm's current season, please contact Barnstorm, or the Theater Arts Department Office. If you are a student interested in working as an assistant director on a Barn show, the process is the same as ADing for department shows: contact the director directly, and they will make a decision. To direct, assistant direct, or otherwise work on a Barn show you must enroll in Barnstorm (Thea 55A/B) as a 2 or 5 unit class. Barnstorm as a class does not count toward the Theater Arts Major or Minor, though the units will count toward graduation. Theater Arts students are encouraged to get involved in as many productions as they have opportunities for, regardless of counting toward the major, as long as it does not infringe upon academic studies. Select years the department is able to award the Dharma-Grace award to a student playwright for a submitted script of exceptional merit. In years when the award is given the chosen script will be made available to students interested in directing who will then submit directing proposals for the Dharma-Grace show. A committee of faculty will review the proposals and select a student director. This is a separate submission and proposal process from the main student director proposal process, outlined below. The UCSC Theater Arts Department usually produces one to three student directed productions during the school year. These productions are rehearsed and performed in one of the three main Theater Arts stages, given a moderate budget by the department, with the production team having access to and support from the shops and labs of the department. Directing proposals for the department are generally submitted towards the end of Spring Quarter for the subsequent year. A committee of faculty members will review all submitted proposals, and select the student or students who will direct for the department in the coming year. Students will be contacted with the committee's decision, and selected shows will be announced with the specific spaces and quarters they will be produced in. Students may make requests for specific spaces and/or quarters for their production in their directing proposal, though flexibility is very helpful to the committee in trying to plan out the Department's season. A directing proposal will consist of, at the least, a copy of the script of the play a student would like to direct, an overview of the student's vision for the show, including any particular visions for design, why the department should want to put on the show, and the student's background in directing. Directing proposals must also be accompanied by a letter of support from a faculty member, who can offer support and confidence in both you and your show. Directing faculty in the department generally hold a directing proposal workshop during Spring Quarter, to help prepare students for this process, or answer any questions. You can contact the Theater Arts Department Office for dates, or speak to the directing faculty during their office hours for more information. Proposals will be selected based on the student's experience and demonstrated capability as a director, as shown in classes or previously directed shows, the feasibility of the department being able to adequately produce the show as envisioned, opportunities for students in the show, and overall quality and relevance of the vision for the production. Chosen student directors must complete paperwork with an assigned faculty advisor to register their production as a student-taught class and complete Title IX training. All students involved in a student-directed production must enroll in the production as a 5-unit class. Student directed productions do not count toward the Theater Arts Major or Minor. Grades for the production will be assigned by the fauclty advisor, under advisement of the student director. Click here to download the Student Directors Proposal application packet. Questions may be addressed to the Student Production Liaison: studenttaucsc@gmail.com. Shakes to Go is a 50-minute version of one of Shakespeare's plays, performed by UCSC student actors on tour during the spring quarter. Student directors may request to be an AD to the directing faculty member during the course and rehearsal period in the winter quarter, giving them the opportunity not only to observe and assist in the directing of Shakespeare, but to be a part of a unique rehearsal period that involves editing Shakespeare for time constraints while retaining the essential story in a palatable form for young students. Shakespeare to Go rehearses as a class during winter quarter, which counts towards the faculty-directed production requirement of the Theater Arts Major. There are a number of other opportunities for directors in the UCSC community not directly sponsored by the UCSC Theater Arts Department.